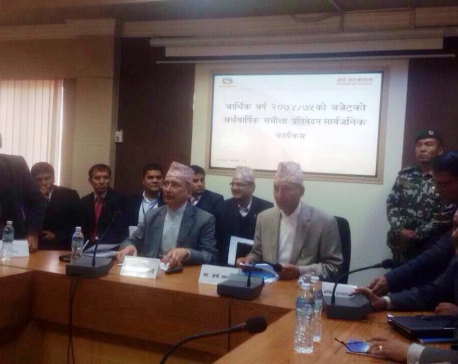 Finance ministry has currently become like a 'ministry for managing unlimited liabilities', says Khatiwada. KATHMANDU, March 8: The government has revised down the economic growth forecast to 6 percent for the current fiscal year 2017/18 from the previous economic growth target of 7.2 percent. Releasing the mid-term review report of the budget for the current fiscal year, the Ministry of Finance lowered the growth forecast by 1.2 percentage points to 6 percent for the current fiscal year. Though the preliminary forecast of 6 percent is lower than the initial target of GDP growth in the budget speech, it is still higher than the forecast of other multilateral institutions like the World Bank and the Asian Development Bank who have said that the growth is likely to average around 4.5 percent. 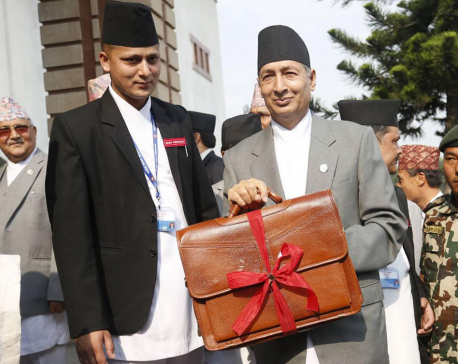 Finance Minister Yuba Raj Khatiwada admitted that the budget for the current fiscal year that targeted to achieve 7.2 percent economic growth through increase in public expenditure and promotion of private sector investment could not be implemented as expected. "As the Nepal government was focused on holding the elections of parliament and provinces, development expenditure could not be put to use while the recurrent expenditure surged unexpectedly. Similarly, the macroeconimic indicators were not satisfactory as there was slackness in the collection of taxes, rise in import and fall in exports growth, fall in remittances and balance of payment and current account slipping into negative territory," Finance Minister Khatiwada said in the report. "So, it seems difficult to achieve the growth target this year," added Finance Minister Khatiwada, who was handpicked by Prime Minister KP Oli by brushing aside several senior UML leaders aspiring to lead the ministry. Finance Secretary Shankar Prasad Adhikari said that improvement in energy supply, expansion of industrial capacity utilization, pick up in reconstruction activities and overwhelming rise in tourist arrivals are major factors contributing to growth for the current fiscal year. Against concerns that the last year's floods and landslides could dampen the growth momentum, Finance Secretary Adhikari said that agricultural output will not be affected. "There were worries that the floods would damage the crops. While paddy production is likely to grow less than expected, it [floods] made positive impact on some agro crops," he said. As budget implementation did not improve much in the review period, the Finance Ministry revised the total budget expenditure to Rs 1,048.78 billion compared to the total allocation of Rs 1,278.99 billion in the budget speech. The revised expenditure estimate is 84.67 percent of the budget allocation. Khatiwada, who held the first press meet after being appointed as finance minister, said that the ministry has currently become like a 'ministry for managing unlimited liabilities'. "The current government is striving to meet the aspirations of the people which are unlimited," Finance Minister Khatiwada told the press meet, referring to the budget programs which he said were introduced without making arrangement for the resources. "Forget the liabilities created in recent days which we have not calculated yet," he said referring to the hand-outs and distributive programs announced by the erstwhile government.